Barr, the sitcom and its ensemble cast are vying for Emmy nominations to be announced Thursday morning. They were submitted for consideration before the show was axed and no one — including its lightning-rod star — asked to be withdrawn. The comedian could have "ducked and hidden" because of her online insult targeting former Obama aide Valerie Jarrett that prompted ABC to cancel the series despite its high ratings, said Tom O'Neil, author of "The Emmys." Barr and others who worked on the show are hoping that attention will be focused on what they achieved and not the controversy, said O'Neil, editor of the Gold Derby awards handicapping website. The "Roseanne" revival threw a political twist into the mix: Barr's support for President Donald Trump was mirrored by her character, Roseanne Conner, who gleefully clashed with her liberal sister. Viewers liked the approach, making it the most-watched series last season with an average audience of 18.7 million tuning in on Tuesdays. 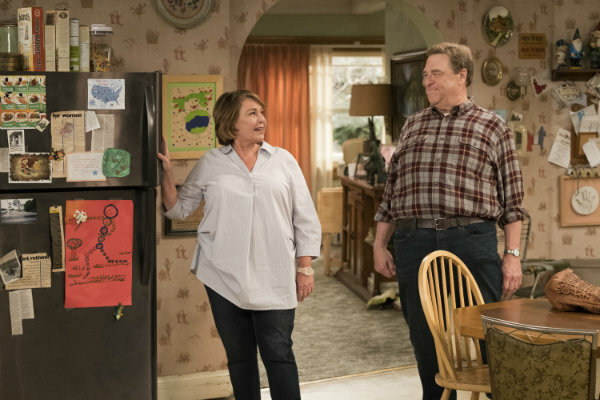 Writers, directors and cast members including Laurie Metcalf, John Goodman and Sara Gilbert have reason to seek Emmy attention beyond ego: It's a chance to highlight "The Conners," the spinoff featuring the ensemble cast minus Barr that's set to air next season on ABC. There will be other contests to scrutinize when Samira Wiley ("Handmaid's Tale") and Ryan Eggold ("The Blacklist," upcoming "New Amsterdam") announce nominees for the 70th Primetime Emmy Awards beginning at 11:25 a.m. EDT Thursday. The ceremony airs Sept. 17 on NBC with Colin Jost and Michael Che of "Saturday Night Live" as hosts. The growing dominance of streaming services including Hulu and Netflix, combined with premium cable networks HBO and Showtime, continue to overshadow the broadcast networks that were once the very definition of television. Although they air the annual awards in rotation, ABC, CBS, NBC and Fox are fighting for viewers and a place at the Emmy banquet. In the best drama series contest, last year's champ was Hulu's "The Handmaid's Tale," which is expected to defend its title against previous two-time winner "Game of Thrones." The HBO fantasy saga missed airing within the 2017-18 eligibility window due to its production schedule but is back in contention for its next-to-last season. "Handmaid's Tale" star Elisabeth Moss, winner of last year's top drama actress award, is likely to end up competing one more time against another Elizabeth — Claire Foy's British queen in Netflix's "The Crown," with Foy abdicating the role as the saga progresses. Mandy Moore, whose "This Is Us" character Rebecca endured the death of Milo Ventimiglia's Jack, could reap her first nod. Ventimiglia may end up vying with formidable NBC series castmate Sterling K. Brown, who won the award for drama series actor last year and a trophy the year before for "The People vs. O.J. Simpson." On the comedy side, the contest is wide open with the absence of three-time HBO winner "Veep" and its powerhouse star Julia Louis-Dreyfus — six lead actress trophies for the show — because of production timing. FX's "Atlanta," which earned best acting and directing trophies for creator-star Glover, is expected to be in the mix with Amazon newcomer "The Marvelous Mrs. Maisel" and NBC's "Will & Grace," the other big sitcom revival. Glover may have an unexpected rival in Bill Hader, star of HBO's hitman comedy "Barry." ''Mrs. Maisel" star Rachel Brosnahan has considerable buzz for an acting nod, but she'll be face serious competition likely including Tracee Ellis Ross of ABC's "black-ish" and Allison Janney of CBS' "Mom," fresh off an Oscar win for "I, Tonya." Every year offers another measure of how the 20,000-plus member Academy of Television Arts & Sciences is inching toward diversity. In 2015, "How to Get Away with Murder" star Viola Davis became the first actress of color to win top drama series honors. Last year, when Brown and Glover won, Lena Waithe became the first African-American woman honored for comedy series writing, for "Master of None," sharing the award with series co-creator Aziz Ansari, who is of Indian heritage. If "Roseanne" ends up in the running, the comedy about a blue-collar family's struggles will show voter openness to economic diversity as well — a rarity on TV and in the Emmys. In its original 1988-97 run, "Roseanne" failed to earn a single best comedy-series bid, with some observers pointing toward the industry's ingrained preference for sitcoms about affluent characters, such as the much-honored "Frasier." Or "Will & Grace," which in its original 1998-2006 run earned 83 nods and won 16 Emmys, compared to 26 nominations and four trophies for "Roseanne." While "Roseanne" was slighted, its cast wasn't. Metcalf received four nods and won three times for her portrayal of Barr's sister, Jackie, while John Goodman, who played husband Dan Conner opposite Barr, was nominated seven times (without a win).